Earlier this year I became a tad garden crazed. It helped having a single tomato plant produce 666 individual cherry tomatoes. I kept a tally of everything I harvested and the long warm autumn encouraged the mass planting of seeds. I was determined to produce a lot of winter vegetables. I got sick so at the end of May I planted the biggest seedlings in the garden and left the rest to die. I planted the garlic very early and figured a few extra weeks couldn't hurt. Three months passed. The first thing I checked when I got home from the hospital was the state of the garden. The big storm in June was not kind to many of my plants in the front garden. There was growth, but it was very small. As I write most of the stuff that went in my garden in May is only getting close to producing anything now. 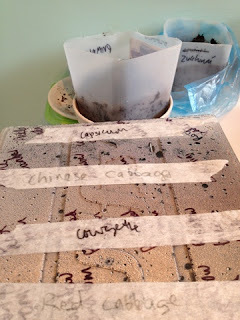 The exceptions were bok choi and Chinese cabbage - two vegetables I was specifically told not to eat on discharge! Ironic. Watermelon - Ice Cream and Sun, Moon and Stars. 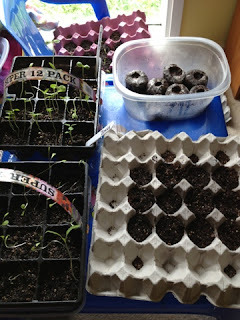 And since it is too cold outside for most of these seeds I am gardening inside. My bathroom (very warm room) and the spare room have become a nursery. 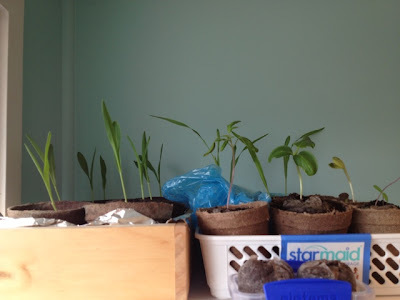 The top of the cupboard is perfect for growing corn. The bathroom sink is, fortunately, wide. The left side. I'm sure that there will be space for everything (finger's crossed). I am determined not to plant things out too late this year - a fatal error in previous years. When I feel sure that we have passed the stage where frosts will come then I will be cheerfully filling in the garden. My aim is to have one whole week this summer where I do not have to buy any veges or fruit. The plum tree that I bought for $5 earlier this year is covered in blossom and my blackberry and raspberry canes are looking promising. We have a huge amount of strawberry plants and this should be the year when we finally get some feijoas. I think a week without buying fruit or vegetables is a real possibility. Is it the type of plum that needs a mate, or a self-fertile one? It is a Billingham plum (self fertile). It also makes a great pollinator if you have a variety that needs one. I still happy with the great bargain. Most of the blossom has now fallen off, so hopefully little plums will start growing soon! Pink flower sushi for six year olds.